Among a half-dozen other changes that made for a busy day for the green and gold, the Edmonton Eskimos have signed a new quarterback through the 2020 season. 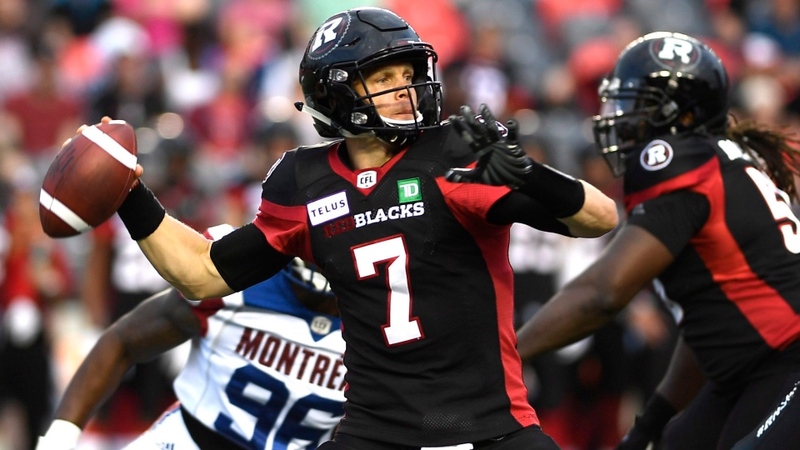 Trevor Harris comes to the team from the Ottawa RedBlacks, where he played 17 games in the last season, and completed 431 of 615 pass attempts for 5,116 yards and 22 touchdowns. The move comes after quarterback Mike Reilly signed a four-year contract worth $2.9 million with the B.C. Lions. Reilly is already the league’s highest paid player, earning over $500,000 last year with the Eskimos. TSN's Ryan Rishaug reported Monday that the Eskimos were willing to match the offer. Reilly, 34, who began his CFL career with B.C. in 2010 before being dealt to Edmonton in January 2013, was regarded as the best player available in a deep free-agent pool that's top-heavy with quality starting quarterbacks. Reilly hasn't missed a game the past three years and thrown for over 5,500 yards each season. After guiding Edmonton to a Grey Cup title in 2015, Reilly was the league's outstanding player in 2017 and has thrown a combined 88 TD passes the past three campaigns. Reilly is a native of Kennewick, Wash., and relocating to Vancouver would move him closer to family. And he's certainly familiar with the Lions, spending his first three CFL seasons in B.C. before heading to Edmonton in 2013. Along with a new quarterback, the Eskimos acquired several other players on the first day of the CFL free agency period. Three new players are international wide receivers: Ricky Collins Jr., from Texas, was signed through to the 2021 season. Greg Ellingson, a Florida product who played for the RedBlacks in 2018, was signed through 2020. The third, DaVaris Daniels, was signed through 2019 after playing in 12 games with the Stampeders last season. Edmonton also signed defensive back Anthony Orange, who was named a CFL West and CFL All-Star in 2018 after playing with the Lions. Offensive lineman SirVincent Rogers was signed on until 2020. Rogers last played for the RedBlacks at left tackle. He has earned the title of CFL East All-Star three times, CFL All-Star twice, and CFL’s Most Outstanding Offensive Lineman once. The seventh addition to the Eskimos roster is Larry Dean, a linebacker from Georgia who appeared in all 18 games for the Tiger-Cats in 2018. He was signed through 2019. And, the Eskimos resigned Travis Bond for 2019. The offensive lineman joined the team in 2018.